The snow leopard is an elusive animal from which the name of a coveted mountaineering award was adopted. 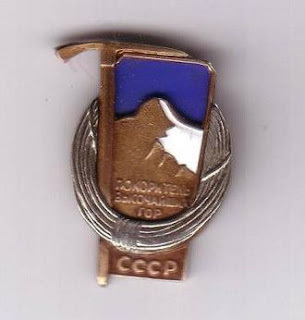 The Snow Leopard Award originated as a Soviet Mountaineering Award, which was given to alpinists who summited the five Snow Leopard peaks. These are some BIG mountains contained in a few countries of which you may not even know their exact geographic location. Tian Shan, Pamir, the Snow Leopard peaks are in these mountain ranges, amongst the highest and wildest on Earth. If you are into climbing mountains and big adventure, these mountains are probably for you. 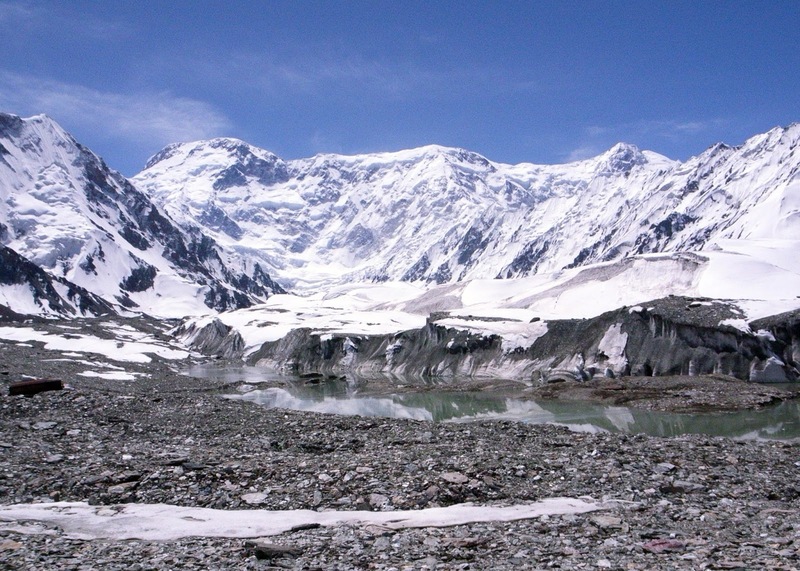 Pik Lenin (7134m) is probably the most attainable of the Snow Leopard Peaks. 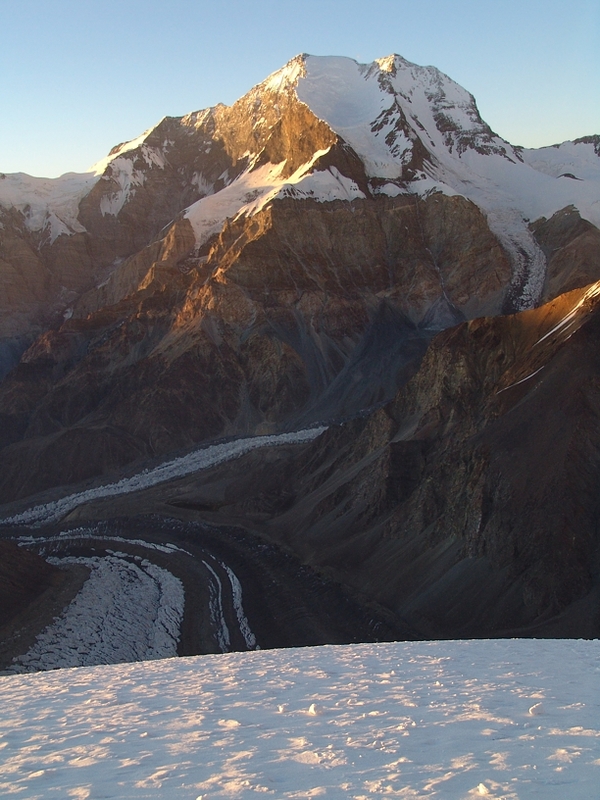 Over the past 2 years I have led a pair of Mountain Madness expeditions to this Pamir peak. The mountain is often used as training for other higher mountains and as a stepping stone to 8000m. As such, Lenin is often compared to Aconcagua though, make no mistake, Lenin is a much different experience. On Lenin, there is a bit of a trek to get into Base Camp at 14,000 ft. After that however, the climb is entirely climbing through snow and ice. The first section, particularly strenuous, from Advanced Base Camp to Camp 1, weaves through massive crevasses with snow bridges that will raise your eyebrows and drop your stomach. Check out my Lenin Trip Report and the Mountain Madness Expedition Page for more information about that climb. From high on Pik Lenin, on a clear day, you can view many high mountains including a couple of the other Snow Leopard peaks - Pik Korzhenevskaya and Pik Communism. Korzhenevskaya (7105m) is usually thought of as the second most accessible mountain on the list. Just across the border into Tajikistan's Pamirs, it's basecamp is shared with those aiming to climb Pik Communism. Reaching basecamp at the Moskvina Glade is almost always accomplished via Russian Mi-8 helicopter - a ubiquitous flying machine in the countries of the former USSR and the "the only civilized way into basecamp." 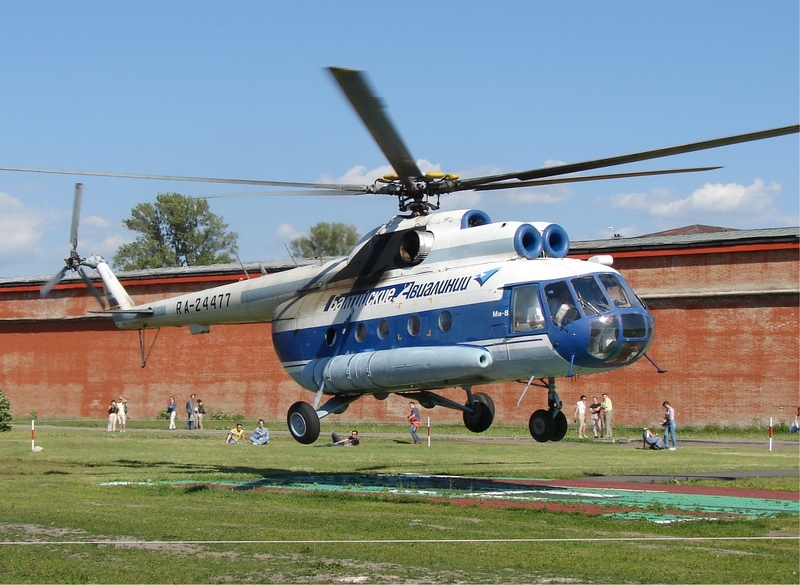 If the thought of flying in an old Russian helicopter scares you, that will relegate you to a back breaking, multi-day affair that has been described to me as "too long" and "savage." Korzhenevskaya is most commonly climbed by the South Ridge and is purported by some to actually be easier than Lenin. However much shorter the climbing days may be on Korzhenevskaya, the climbing is steeper and sections will require fixed rope travel. Pik Communism is a different beast altogether. The mountain neighboring Korshenevskaya is known by many names - Pik Communism, Pik Stalin, Ismoil Somoni and sometimes confused with Pik Garmo. Khrushchev changed the name away from Pik Stalin in 1962 during a nationwide de-Stalinization process and, though the Tajik's have since changed the name yet again, Communism (7495m) is how it is best known. By any name, this mountain is a challenge. The normal route on Communism is the Borodkin Spur and while the route is comparable in technical difficulty to that of Lenin, the Borodkin Spur spends a lot of time at very high elevations. 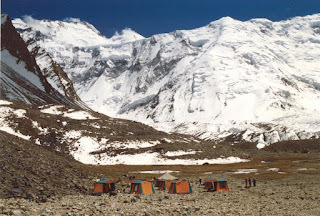 Three of the four camps are above 6000m and Camp 4 is at 6950m. Traveling high plateaus and ridge lines for many days exposes teams to notoriously high winds. The Pamirskoe Plateau, where 6200m Camp 2 sits, is reportedly one of the highest and largest plateaus in the world - 3 km wide by 12 km long. In addition, the Fedchenko Glacier, which starts on Pik Garmo and is fed by tributary glaciers on Pik Communism, is the longest glacier (48 miles long) outside of the polar regions. This is wild land! The final two Snow Leopard Peaks are located on the border between China and Kyrgyzstan in the Tian Shan Range. 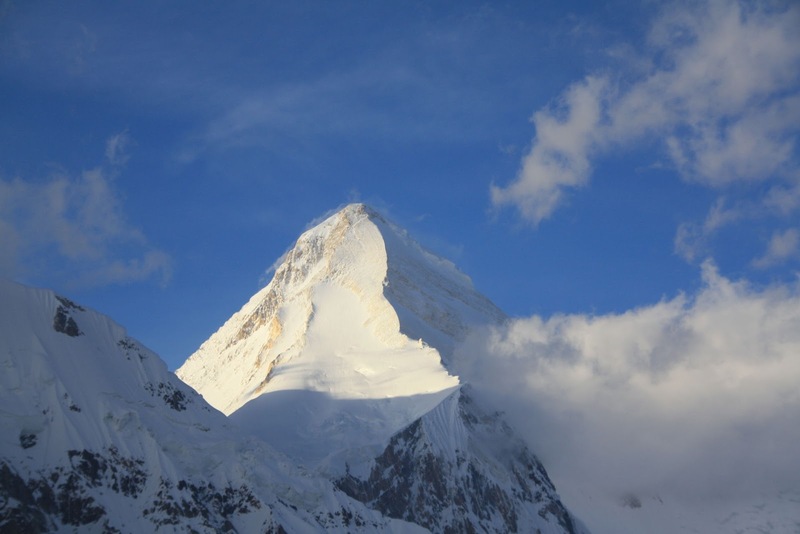 Khan Tengri (7010m), a perfect pyramid, also shares a border with Kazakhstan and has to be the most striking mountain on this list - Anatoli Boukreev, no doubt a connoisseur of high peaks, believed the symmetry of Khan Tengri made it amongst the most beautiful in the world. Kan Tau, in Kazakh, means blood mountain - referring to the color of alpenglow on the marble summit. Khan Tengri is the most northern 7000m peak in the world and thus, the climbing season for this technical peak is quite short. The lower slopes of the mountain involve serious glacier travel while the summit push is sustained around 40-45 degrees and has a crux rock pitch at 6700m. The climb is rated 5a on the Russian scale which, by definition, includes sections of technical climbing on low 5th class rock and steep snow and ice. Like most popular routes, the classic Progrebetsky route, though technical, will often have fixed ropes in situ. South Inylchek Base Camp is approached via Mi-8 helicopter and is shared for climbers attempting Pik Pobeda. Peak Pobeda (7439m), the highest of the Tian Shan and the highest in Kyrgyzstan, lies just south of Khan Tengri. 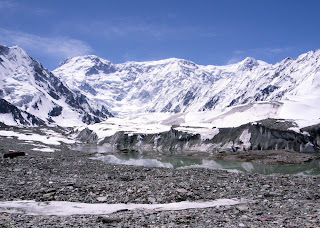 Though not the highest on the list (that distinction belongs to Kommunizma), Pobeda is considered to be the most difficult and most dangerous of the Snow Leopard Peaks. The classic route begins on the Zvezdochka Glacier and works up the northern side of the mountain, threatened by icefall and avalanches, to the West Ridge. Being amongst the most northerly 7000m peaks, hundreds of kilometers north of the Himalaya, Pobeda is frigid cold and, upon reaching the West Ridge, the route traverses the ridge for 12 kms - all over 7000m - to the summit. Pik Pobeda means "Victory Peak" and to summit this massif, along with the other five Snow Leopard peaks, would truly be a victory in a massive undertaking. If this massive undertaking is something that interests you let me know and let's make it happen together.